This one of a kind, polished double terminated Lapis Lazuli and Alabaster point pendant was handcrafted in Brazil and is set in a fine .925 Sterling Silver mounting. Pendant measures 1 7/8" L - 9/16" W - 3/8" D.
Lapis Lazuli is the alternate birthstone for the month of September. Lapis Lazuli is the ninth wedding anniversary gemstone. Lapis Lazuli is a sixth (brow/third-eye) chakra gemstone. Metaphysical Properties: Lapis Lazuli is known as a "stone of total awareness", it helps one to remain objective and provides clarity and mental endurance. It�s said to help overcome depression and to bring cheer to the user and bring success in relationships. Alabaster is a fine-grain variety of Gypsum. The Alabaster used and treasured by the ancient Egyptians is actually Calcite. Alabaster is the thirty seventh wedding anniversary gemstone. Metaphysical Properties: Alabaster can help to unlock the �secrets of the pyramids�. 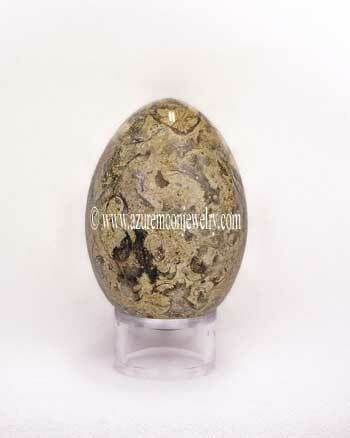 It can also be used to energize other minerals by placing another mineral upon the Alabaster. When carved into geometrical forms, it can be a stimulus for meditation, to promote the centering of the self and to further ones mental acuity. Click here to learn more about the lore and metaphysical properties of Lapis Lazuli, Alabaster and other popular gemstones.